When asked if carrots are good for your eyes, some might reply, "Have you ever seen a rabbit wearing glasses?" The same sentiment might apply to dogs that are fed carrots as a regular part of their diets. Carrots are well known for promoting good vision, and in both humans and dogs, they nourish the optic nerve and promote good visual health. In addition to their visual benefits, carrots are also a rich source of the pro-vitamin beta carotene, a nutrient that can be converted into vitamin A. Beta carotene's are powerful antioxidants that can help to prevent cancer. Cancer in dogs is the number disease that affect them and the use of nutrients that remove free radicals helps the to prevent it. Carrots also contain vitamin C, a nutrient that helps produce collagen in bones, muscle, cartilage and blood vessels so that iron can be absorbed by the body.In addition to vitamins A and C, carrots are sources of vitamins D, E, K, riboflavin, niacin, calcium, potassium, phosphorous, sodium, magnesium and iron. These important vitamins and nutrients support the dog's immune system and digestion. Broccoli is one of the most nutrient-dense vegetables that dogs can eat. In addition to vitamins A, C, D and beta carotene, broccoli contains folic acid, fiber, chromium and calcium.When you cook broccoli, indole, a cancer-fighting enzyme, is released. In fact, more than 33 cancer-preventing compounds are found in broccoli . Broccoli also contains several phytochemicals that stop carcinogens from forming and prevents them from attacking cells. They also build enzymes to breakdown carcinogens. Broccoli is an excellent food for dogs because it is a low glycemic vegetable, meaning that it does not raise blood glucose levels. It also converts to glucose very slowly, preventing the release of insulin that can lead to weight gain. Aside from broccoli's nutrient-rich and cancer-fighting properties, it also features sulforphane, a compound that helps boost the immune system. Although broccoli can be fed to a dog safely, give this vegetable to them in moderation, as it can reduce thyroid function when given in large quantities. When dogs consume cantaloupe, they're taking in vitamins to promote good eyesight and eating a food with major antioxidant powers. Cantaloupes are an excellent source of vitamin A because they contain lots of beta carotene. In humans, cantaloupe consumption has been linked to a reduced rate of cataract growth [source: World's Healthiest Foods]. 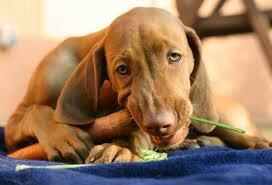 Similarly, the vitamin A content of cantaloupe helps to promote good vision in dogs [source: Donamor]. The beta carotene found in cantaloupes also reduces the risk of cancer and prevents oxygen damage to cells. In addition, cantaloupe contains vitamins B-6 and C, as well as fiber, folate, niacin and potassium. Vitamin C acts as an antioxidant that can help to prevent cancer. Cantaloupe is a particularly good fruit to feed to dogs because it is usually not allergenic, so most dogs will be able to consume it without experiencing an allergic reaction. Harmful goitogens, naturally occurring substances that reduce thyroid function, and pesticides are usually not found in measurable amounts in cantaloupes. Studies have also shown that green bean intake in animals can improve blood fat levels and protect against oxygen damage. Green beans also contain omega-3 fatty acids, which also contribute to the cardiovascular benefits of this vegetable. Green beans are a great source of vitamins A, C and K, as well as calcium, copper, fiber, folic acid, iron, niacin, manganese, potassium, riboflavin, and thiamin. Green beans also contain high concentrations of beta carotene.These legumes promote bone health because they contain silicon, vitamin K, calcium, magnesium and phosphorous, all essential nutrients in maintaining strong bones. Vitamin K helps maintain bone health because it triggers osteocalcin, a non-collagen protein in bones. Want a strong and healthy dog? You can have your very own canine Popeye if you feed him spinach. This nutrient-dense green contains twice as much iron than many other greens [source: BARF Diet]. This leafy green vegetable is also a good source of fiber, calcium, potassium, and vitamins A, B6 and K.
Spinach is particularly good for dogs who need to ward off inflammatory and cardiovascular problems as well as cancer. The flavonoids and carotenoids contained in spinach work as anti-inflammatory and anti-cancer forces. Studies on animals have shown that spinach extract can reduce rates of skin cancer [source: World's Healthiest Foods]. Apples contain a multitude of important vitamins and nutrients. In particular, Red Delicious, Northern Spy and Ida Red apples contain powerful antioxidants. As with most vegetables, organic apples are best for dogs; they contain one-third more antioxidants than regular apples [source: Donamor]. Apples are an excellent source of vitamin C for dogs; in fact, one apple contains about 1,500 mg of vitamin C [source: Donamor]. The skin of an apple contains high levels of vitamin A and pectin, a fiber that can improve digestion by strengthening intestinal muscles. Pectin also works to get rid of toxins in the intestinal tract and creates short-chain fatty acids that keep away dangerous bacteria. If your dog doesn't like eating apple slices, put apples in a food processor to make applesauce that you can use as a base for apple dog biscuits. If you're looking for a fruit to strengthen your dog's the intestinal tract and heart, the pear is the perfect piece of produce for your pooch. Pears contain pectin to help strengthen intestines. They are also sources of potassium, a nutrient that aids in maintaining heart and muscle strength as well as nerve transmission and carbohydrate metabolism. Pears can be particularly good for dogs who suffer from constipation or irregularity. The fiber found in pears promotes colon health by binding with bile salts and carrying them out of the colon. Bile salts partially consist of cholesterol, so taking in fiber through pears will not only improve colon health but also reduce cholesterol levels. In addition to building the cardiovascular and digestive systems, pears have antioxidants benefits. They are rich in vitamin C, a nutrient that works against oxygen damage from free radical damage. In addition, vitamin C promotes dogs immune system health because it triggers white blood cells to combat infection, kills harmful bacteria and viruses, and stimulates vitamin E if it has been deactivated by free radicals. In addition to the health benefits of vitamin C and the other nutrients found in oranges, this fruit many other health benefits. Studies conducted on humans show that consumption of oranges can help prevent cardiovascular disease, lower cholesterol levels, lower the risk of stomach cancer, promote respiratory health and prevent rheumatoid arthritis. While studies have not been conducted to find if these health benefits extend to dogs, chances are that your pooch may experience similar health benefits if he chows down on this citrus fruit. Some dogs find citrus causes diarrhea or is hard to digest. You lessen the chance by removing the seeds and the rind before serving. Pumpkins aren't just good for carving at Halloween; they're also a healthy food to feed your dog. If your dog is prone to tummy trouble and experiences diarrhea or constipation, a diet that includes puréed pumpkin might improve his intestinal health. Pumpkin softens stool, which aids dogs who suffer from digestion problems. The fiber contained in pumpkin also absorbs water which helps alleviate diarrhea. Pumpkin is such a rich source of fiber that you only need to add a few teaspoons to your dog's daily diet to improve his intestinal health. If you dog is overweight, pumpkin is an excellent food to incorporate into his diet because it gives animals the feeling of being full while being a low-calorie food. Pumpkin also is loaded with vitamin A and anti-oxidants, provides anti-inflammatory benefits, helps to regulate blood sugar levels and promotes cardiovascular health.